At Wit's End: Failure “Is” An Option? During every test flight, the Wright brothers brought not only their plane, but also plenty of materials to repair any damage that was done from the inevitable crashes that would occur. Wayne Gretzky is famously credited with the quote, "You miss 100% of the shots you don't take." His career shooting percentage: 17.57%. In explaining some of my ideas to people recently, and in talking to others about problem areas in their own projects, the topic of "failure" has come up pretty frequently. "What if you fail?" "What if nobody _________?" "What if my dream doesn't pan out and I have to give it up?" "Am I already a failure?" My answer to these people: the only way to truly fail is by not doing anything in the first place. So your big idea didn't pan out exactly as you intended. You likely learned several excellent lessons along the way, met some key people, or otherwise found a new perspective on life. I know that doesn't necessarily pay the bills or feed the family, but it's damned important to moving in a direction where you can live the life you want to live. So you didn't become a world-class chef/chess grandmaster/big-firm attorney. It can be tougher with dreams like becoming a professional athlete or a Broadway star, which may have somewhat finite shelf lives. You never know though—look at that guy from The Rookie, or Jon Hamm—things can have a funny way of working out if you can find a way to persist long enough, knocking on the right doors. If circumstances outside of your control dictate that you have to abruptly give up your dream and go in a different direction, it doesn't have to be permanent! Try to live within your means, saving a good portion of your money, gathering more "dry powder" for when the next opportunity presents itself; for your next flash of genius that might be "The Big Idea." Put those skills that you developed pursuing your own dream to good use. Don't think of it as a failure—it's a setback. You can always overcome setbacks, but the finality that "failure" implies can act as a black hole, sucking out all of the creativity, passion, and drive that made you "you" in the first place. No matter what, after one of these setbacks, do not wallow in your own self-pity for an extended period of time. Don't pull the "woe is me" act—you'll annoy your friends and family, and become a useless lump of crap ("ULOC"), which is the worst thing in the world to be. Instead, think of other potential avenues to explore. What was it that you liked about your previous dream? For example, if you wanted to be a movie star, did you want it because of your passion for the craft of acting or because you craved fame? If it's for the acting, there are plenty of community productions in which you could become involved that should satisfy that itch, while allowing you to have a "day" job to support yourself or your family. If it's for the fame, well, in the age of the internet, there are plenty of ways to get famous. Consider putting up a lot of funny shorts on YouTube in your spare time, or become a prolific twitterer. Either way, you'd be moving toward that aspect of your goal. Boil down your previous goal to the part that you value most, and try to capture that in some aspect of your life. Don't let the perfect be the enemy of the good. This isn't to say that you should settle—that's a completely different concept. This is about pursuing your dreams in a different manner while saving up for the next opportunity. Five years from now, your life could be completely different, and the pressures of a significant other, kids, or whatever could re-arrange your values to the point where your dream is simply not feasible for an extended period. You aren't necessarily settling, and you should certainly stay connected to your dream in some way, so that you can pick it up again if the opportunity presents itself. Goals shift. People change. The important thing is that you keep firing shots at the net like Gretzky. Well, not literally, unless you're aiming to be an NHL player, but you get the idea. Keep pushing and pursuing your dream however you can given your circumstances. Hey, you never know where it might lead you. You might even be able to surpass the achievements of a couple of bike mechanics who never gave up on their dreams. Questions? Comments? 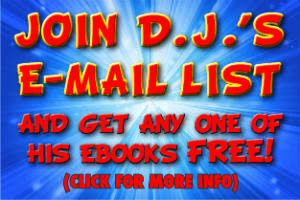 E-mail me at djssuperblog@gmail.com. Follow me on twitter at @djgelner.